McNary High School is bringing William Shakespeare’s play Julius Caesar to the Ken Collins Theater stage May 17-20 but instead of physically murdering Caesar they are socially murdering him. 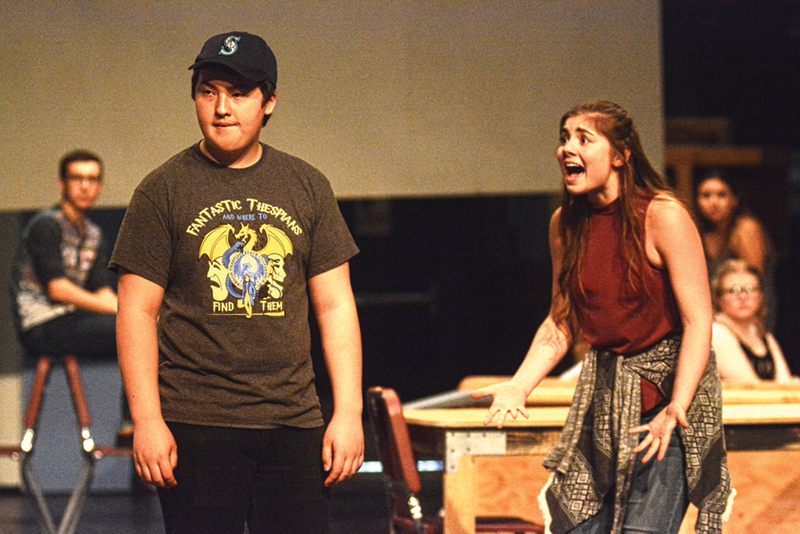 The play, adapted by McNary drama director Dallas Myers with the help of students, is titled #Caesar and takes place in a present day high school. All four performances begin at 7 p.m. Tickets are $5 and available at mcnaryhs.ticketleap.com/caesar. The play has a strong anti-bullying message. McNary senior Annie Purkey plays one of the biggest bullies—Cassius. Purkey, who’s been picked on in the past, wanted to see what it was like to be a bully. McNary is using a series of movements to show the damage bullying can have at a high school. Everyone is affected by the bullying, not just Brutus, which really comes out in the Battle of Philippi scene. “Everybody has had their backs turned on them at one point so it’s showing how far that can escalate and it really does affect every single person,” Purkey said. Senior Spencer Lamb, who plays Caesar, said the dialogue in the play still sounds a lot like Shakespeare, including long monologues. He also recommends people pay close attention to the way the different characters move. While Henifin, Purkey and Lamb are all seniors and have been in many McNary productions over the years, #Caesar will be the first for freshman Isabel Pineda, who plays one of the conspirators plotting against Caesar. Pineda has never taken a theatre class but has wanted to give it a try ever since watching her cousins preform in shows at McNary.